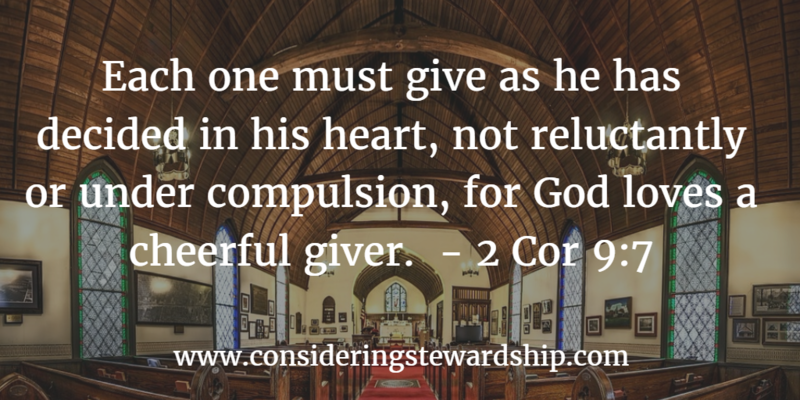 According to Paul’s commands to the Corinthians giving and stewardship intentional. We must give as we have decided. Deciding is an intentional processes. We are to think about our giving before it comes time to give. The Bible doesn’t leave us with the option to look at how much money we have when it’s offering time. This is one of the reasons stewardship principles should be part of church teachings about money. If we are not able to handle our money we will not be able to be intentional in our giving. We will be thrown by the winds of our personal economic challenges. In just the previous chapter Paul gives further instruction on giving. He tells the Corinthian church how to give to the family of God in Macedonia. He is clear that they are not to give more than they can afford, necessarily. But to give as a means of fairness. For if the readiness is there, it is acceptable according to what a person has, not according to what he does not have. For I do not mean that others should be eased and you burdened, but that as a matter of fairness your abundance at the present time should supply their need, so that their abundance may supply your need, that there may be fairness. How do you know if you are burdening yourself? How can you know what you can give cheerfully if you have no idea where you stand financially? You can’t! God calls us to be good stewards of the gifts God has given us; our time, money and talent. We are called to give them away generously so that our brothers and sisters will not be in need. If we don’t bother to take care of those things, we will not have them when we are called to give them away. Good stewardship is intentional it is not something you can do last minute, it is something to be thought about ahead of time. 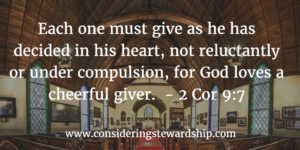 It is why this site tries to walk the balance between practical personal finance tips and examining the biblical call to steward our gifts well.